Hello world, it’s Friday 21st July and just like every other Friday, we’re back with our weekly tech news round up. This week’s news covers Microsoft launching a Cortana powered thermostat, Google introduces Feed, Amazon launches Spark, Google Glass comes back from the dead, Jide pulls the plug on Remix OS in favor of Enterprise Solutions and Amazon reportedly working on a new messaging platform. That’s a lot of good news to go over, so without wasting any time let’s get right into it. The nest is a popular brand when it comes to smart home appliances. The Nest thermostat is one of the highest rated products in home automation. 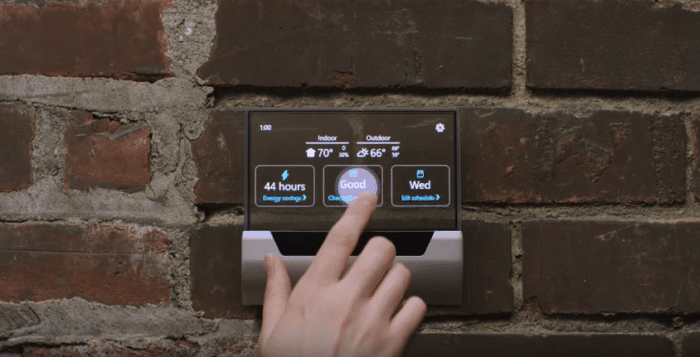 This week Microsoft stepped into the game by announcing a product that they have built in collaboration with Johnson Controls, the makers of the first electric thermostat. Microsoft made the announcement via a YouTube video and while the physical device won’t be available until later this year, from the looks of it and the render it definitely looks like it comes equipped with a translucent touch screen display. The screen gives it a futuristic vibe as if it were manufactured by Stark Industries. GLAS is powered by Windows 10 IoT Core OS and will come with Cortana support. This is the first hardware which is shipping with Microsoft’s homegrown smart assistant and definitely the world’s first thermostat to come with an assistant of any sort. The thermostat has sensors to detect activity inside a room so it’s smart enough to figure out if you are in the room or not. The sensor array is designed to make your home power efficient much like the Nest. The only differentiator here is the presence of Cortana and voice controls but it will still face competition from the likes of Ecobee4 which comes with Amazon’s Alexa built in. The promo that Microsoft released is marketing this hardware as a product for businesses and commercial environments. It’s also worth noting that GLAS will be powered by Microsoft’s Azure Cloud Services. Ever since Google Now was launched with Jellybean, it’s become a handy tool for people who like to keep their days organized. It is a one stop location to get an insight into your day and to quickly glance through information like traffic on the way to work, upcoming meetings and other calendar information. Google really supercharged Google Now. This week the company announced a new iteration for Google Now. It’s being called Feed and as the name suggests it’s a scrollable feed of relevant news for Android and iOS. Google previewed its new feed in December when it introduced the feature to its Android app. Previously, the space below the search bar was reserved for Google Now, the company’s predictive search feature, which displayed personalized weather, traffic, sports scores, and other information. Before this, the company used to use the space beneath the search bar for Google Now which displayed information relevant to users like their sports cards or commute information. Now with Feeds seems like a reimagined product. The main section under the search bar will be reserved for cards relevant to the user. So if you are an executive your feeds may include articles related to stock price changes while a musician may have articles about new album releases..The search giant says that it’s been working on algorithms to refine the product and prioritize relevance. When you will perform searches in the app a subset will show a follow option alongside results. News sports and entertainment are among categories That can be followed. 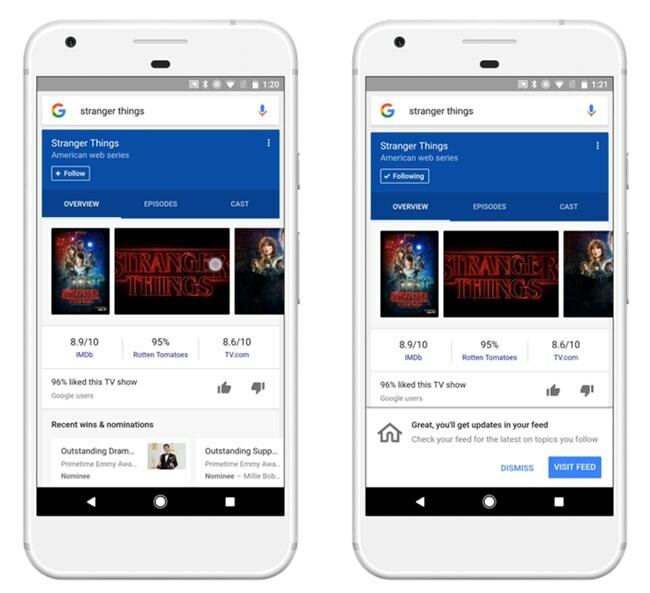 Once followed Google will work to bring you related content into the feed. You can further customise each feed by tapping on 3 dots on top of each cards. Despite their feet in multiple domains, Amazon still happens to be an e commerce service which is here to make your shopping experience better and easier. Ever since it’s inception Amazon has had a website and apps fairly recently, to cater to your shopping needs but we’ve not had any significant invitations in this space. That was until this week. Amazon rolled out Spark this week which is a shoppable feed of items for Prime customers. Before this week’s launch inside the United States. The goal of the program is to shift the social activity around its product on Twitter and Facebook etc, back to Amazon where it can translate to better growth metrics. In this manner, Spark can be seen as a direct competitor to Pinterest which follows a similar pattern to catering products to users. To get started with using Spark you first need to be on a Prime membership and on their mobile app as the feature isn’t available on the desktop yet. Once the setup process is complete, which includes entering your details and preferences, you can enable notifications. Every time a product is updated spark shall notify you. Now on your main feed, you’ll be greeted with an image heavy feed of product ideas and catalog. And this is your feed, your shoppable feed. In my opinion, this is definitely a way better means of shopping. Spark will be rolling out gradually globally so keep an eye out. Remember Glass? 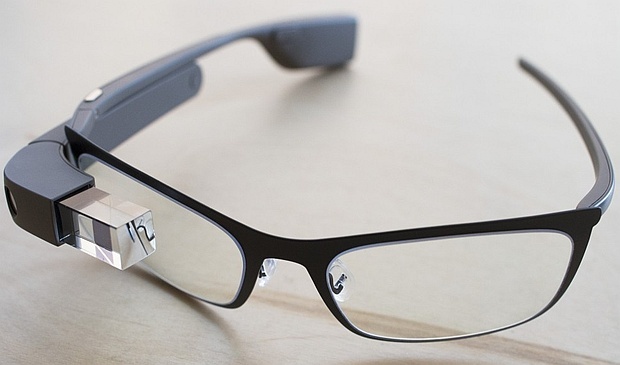 The uber funky Google gizmo which Sergey Brin used to rock pretty publicly? The one which was worth $1,500 under the Explorers Program and was discontinued? Well, Glass is back! and this time it’s not being targeted at the consumers, instead, it’s going to be an enterprise facing product. The major upgrades between the original Glass and the enterprise version are a better camera optics which bump the megapixel count to 8 from the previous 5, better and extended battery life , faster Wi-Fi and a brand new processor to speed things up, it also has an indicator light to notify others if you are recording them. The electronics of Glass have also been made modular in the shape of a so-called Glass Pod, which can be detached and reattached to Glass-compatible frames. This was a huge request among users. You can now use them on prescription glasses and safety glasses all the same. The scale of the Glass EE rollout is still small, with the Wired reporting that sales for the new version has only been in a few hundreds and at the same time Google is giving it out only on a trial basis. However, (Google parent company) Alphabet’s product managers sound bullish about the prospects of Glass in the workplace specially enterprice. Project lead Jay Kothari is quoted as saying, “This isn’t an experiment. It was an experiment three years ago. Now we are in full-on production with our customers and with our partners.” Indeed, according to the latest report, Glass is a huge hit among the enterprise customers and people working directly under the production lines. It assits them by overlaying information right on top of they viewport. Jide the startup that built Remix OS and the Remix Mini which got a lot of traction last year, is reportedly pulling the plug off of Remix OS development. The decision was made as a result of Jide moving away from the consumer market in favor of the enterprise one. 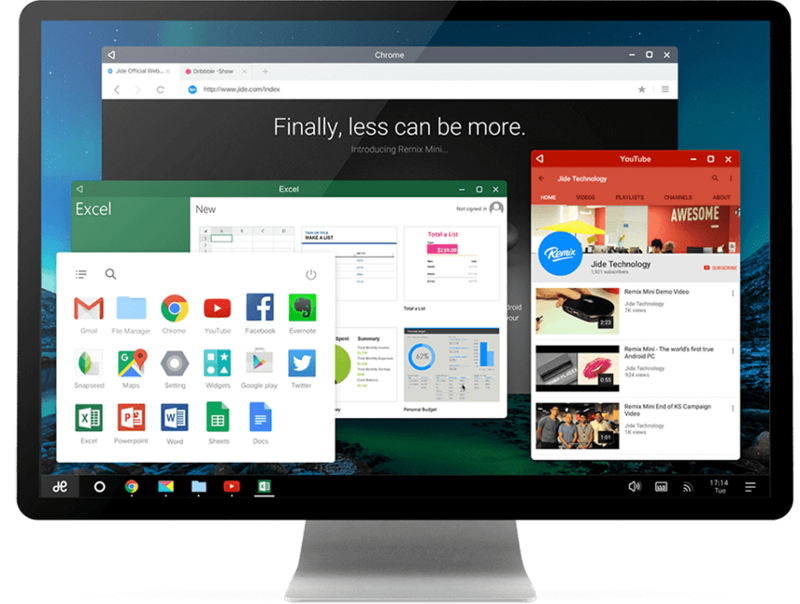 Consequently, all current development for Remix OS on the PC will be discontinued indefinitely. Jide wasn’t exactly clear as to whether or not it would continue to provide support for its existing hardware (Remix Ultratablet and Remix Mini). Seeing the sudden abandonment of their lineup is quite shocking specially to the enthusiast community which has always been interested in modding their Android offering to get the most out of it. If you read our news on a regular basis, then you might be aware of the fact that Amazon has been trying to get into the messaging segment since quite some time. But since their business model on the technology segment remains largely targeted towards the enterprise, they haven’t been very successful. Well, it turns out Amazon may just be a few steps away from making it big. Amazon is reportedly working on bringing a new mobile messaging platform to the table, according to customer survey details obtained by reporters. Other information leaked from Amazon’s customer survey features include additional features like the ability to add color codes to conversations, play games within the app and order food etc somewhat like Facebook Messenger. Users will also be able to share their location and group music listening feature will also be a part of the app. Another Messenger-esque feature is the ability to be able to chat with businesses through the app, make reservations and track orders. 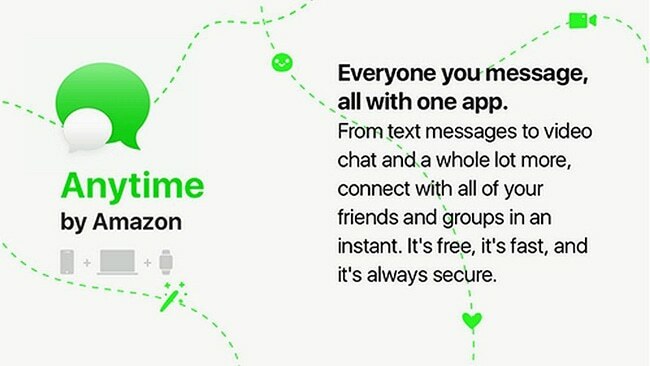 it’s highly possible that the platform will be powered by Chime, which is Amazon’s own in-house chat service for the enterprise. As all Amazon products, this may include Alexa integration especially given that they recently launched messaging and calling feature for Alexa devices.